The Thalassus, a great sea monster, has been terrorizing the northern seas. Anyone who has seen the Thalassus has not lived to describe it, but there are many rumours about it. 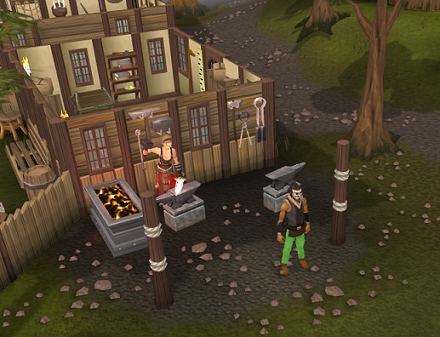 Can you assist Fisherman Jones end the rumours once and for all by capturing the creature? In the taverns of Hemenster, and on the ships of the north seas, Thalassus is talked about in hushed tones. Some whispers claim that the leviathan is as big as a longship, others swear that it could swallow the Lunar Isles. But there is one, universal truth they all accept: Thalassus leaves no soul behind to vouch for one story or another. One fisherman aims to put an end to all that. Forget the tales of fishermen being digested alive in a belly full of fish: this fisherman believes there's fame to be gained! All he needs is a crew, a map and a method of killing the beast. 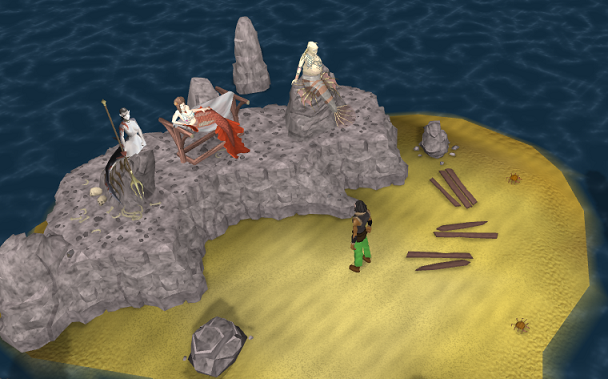 Speak to Jones in the western area of the Fishing Guild. 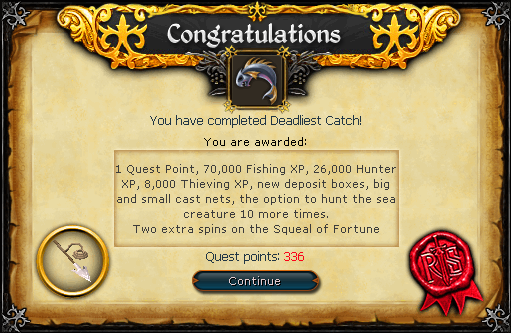 Head over to the Fishing Guild bank. Outside is a man named Jones. Speak to him and he'll say he wants to hunt the Thalassus. You're then given the option to start the quest. Once you've started it, he explains that he needs an extra rower, a giant harpoon and a particular sea chart to hunt the Thalassus. It's easiest to obtain this item first as it's really close. The Master Fisher is just inside the entrance of the Fishing Guild, so walk over there and pickpocket him for the Sea Chart. You also need to speak to him about finding a master smith while you're there. You must speak to him about the master smith otherwise she won't appear. The Master Fisher directs you to Linza, a nearby smith who has been helping a few other fishermen. Head out the gates and walk north east until you come across the town of Hemenster. Linza is found on the very southern edge of it, working on an anvil. She'll appear to ignore you until you mention the Thalassus. She finds it absolutely fascinating and will agree to making the harpoon if you bring back her one of its teeth after you find it. Completely disregarding Jones' plans, she smiths a harpoon that she believes will do the job. You're going to recruit The Guns, one of the builders from the Tower of Life quest who is also Jones' cousin and desperate for a job. He's just outside the Tower of Life, south of Ardougne. He's happy to take the job, but you need to make a potion to stop him from getting seasick. He directs you to Bonafido, who can provide you with some special tea. Then you need to collect some lowland heather that is growing around the tower. Some of it is infected with aphids, but keep searching and you'll get some. Use the heather on the tea and you'll get a Sea Legs potion. He offers to take you back to the Fishing Guild, so travel with him if you wish to. When you're ready to head out, talk to Jones. 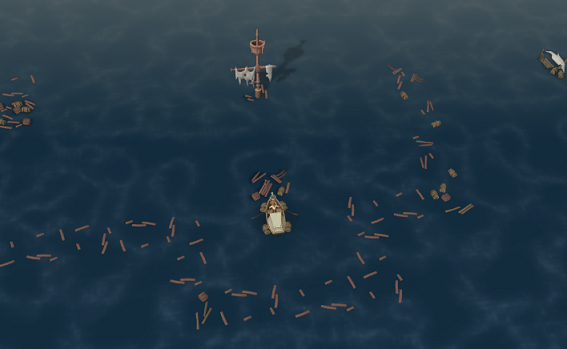 You'll appear on a small rowboat surrounded by wrecked ships. Hunting the Thalassus is much like following animal tracks when training Hunter. Investigate the wrecked ships to find the latest path of wreckage. However, you're only allowed five mistakes when on the trail. Investigate the wrong wreckage to make a mistake. Once you've made five, the trail will be reset, although the path will remain the same. You're also given the option to loot wrecks. When you've followed the trail completely, the Thalassus will appear. At first it'll just be curious, but Jones will anger it and it will knock you and Jones overboard, swallowing him in the process. You wash up several hours later on an island with mermaids. They tell you that you have no hope as you'll be fed to them, but you need to destroy their confidence. Go through the dialogue and select the right lines, otherwise their confidence will reset. The lines you need to say are below. 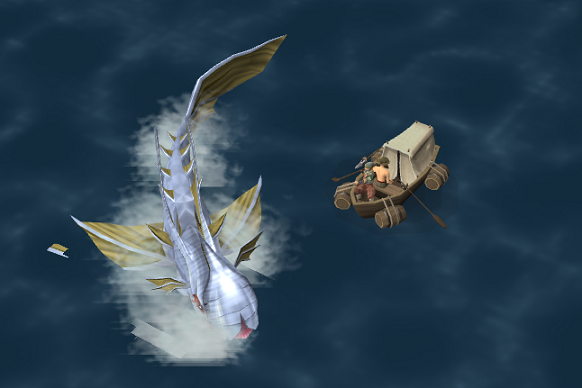 The Thalassus has eaten Jones the mighty fisherman. It should, he's been hunting for decades. Very horrid! After he's killed the Thalassus, he'll probably come after you. Trust me, I'm a great adventurer, I should know. Did I mention Jones has a harpoon with him? Once that's done, you're taken back to your boat and have to find the Thalassus all over again. When you find the Thalassus, you need to feed it Karambwan. It spits out Jones and you make Big Guns row away.